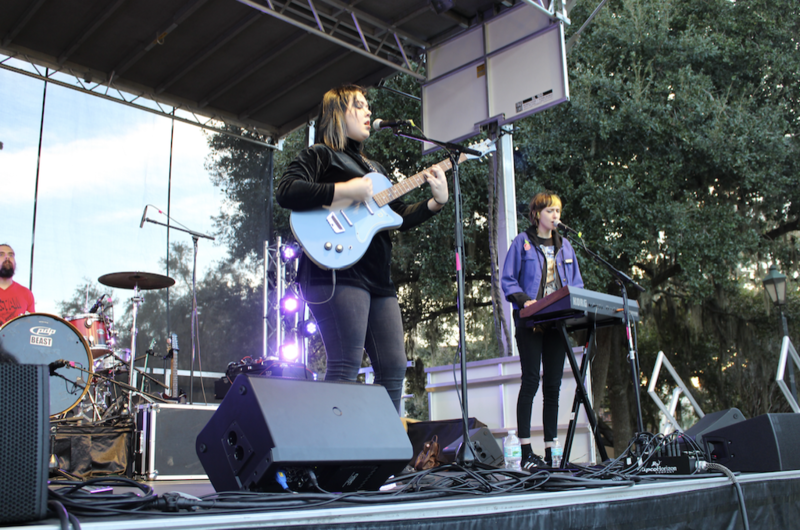 WPRK hosted its annual music festival, Fox Fest, offering students and their families a friendly place to mingle while listening to live local bands. The festival was strategically scheduled in conjunction with Rollins’ family weekend, so a large turnout of students, relatives, children, staff, and faculty were able to enjoy the five unique indie-rock bands that performed throughout the night. Everyone picnicked and mingled on Mills lawn under a large marquee, awaiting the start of the festival at 5 p.m. However, the first band, TV Dinner, did not grace the stage until 6:15 p.m. Such rock and roll tardiness fostered impatience and a sense of disappointment in the audience. Students and their families waited on the lawn for a solid hour, wondering what was going on, and no clear explanation was given for the delay. Some frustrated parents left before the show even began. Despite starting late, TV Dinner took the stage and rocked it. The lead singer’s vocals were refreshing, her voice sweet but gravelly, like Courtney Love’s. Rollins students lined up along the stage and swayed to the band’s vocals and guitar riffs. The highlight of their performance was definitely “Radar,” the last song they played. TV Dinner’s lead singer admitted she was not accustomed to talking on stage. She said she was nervous and eager to get right into the music. This confession was not exactly a bad thing, but the audience could have benefited from a bit more interaction after waiting over an hour for the festival to start. In between acts on the main stage, solo artists played on the smaller stage situated in the marquee tent. The artists’ performances were not small at all, though, and their intimate natures contrasted the main acts well. Manny Rodriguez (’21) initiated the small-stage performances, singing a mixture of contemporary covers such as “What Do you Mean?” by Justin Bieber and “Perfect” by Ed Sheeran. Accompanied by his guitar, he was entertaining and easy to sing along to. E.J. Hervey (’22) also performed on the small stage, and his vocals were instantly impressive, reaching audience members standing well beyond the tent. With a soulful voice and friendly vibe, he performed completely original songs and serenaded the audience with his poetic lyrics. The two main acts of the festival were Acoqui and Pearl & the Oysters. Unfortunately, I was not able to stay for Pearl & the Oysters, but Acoqui was, without a doubt, my favorite band of the night. Coupled with mature musicianship and a lead singer that truly felt comfortable on stage, the band stole the crowd. Long instrumental sections caused audience members to nod and sway to the beat with their eyes closed. Personally, I could feel the beats of the drum in my body, as clear as my own heartbeat. Acoqui was truly a band that transported whoever listened to them. In addition to music, Fox Fest served refreshments to its attendees for a price. One of the options was shaved ice, as well as warm donuts, pizza, and coffee. Overall, WPRK did a fantastic job organizing Fox Fest and creating an artistic space for upcoming, local musicians to connect to college students and their families. Even though there were a few hiccups in the festival and some areas that could have used improvement, I would say that this year’s Fox Fest was exceptionally successful.